Today it is cold, windy and wet; an ideal day for staying in and stitching. I was very good and helped DH tidying the utility room this morning (we still have a lot to do, this is the room that is the place to dump everything that hasn't got a proper home in our house) so this afternoon I escaped to my sewing room. DH has also given up on the sorting and tidying. He "discovered" his guitars and also his gramophone player during the tidy up and so I can hear ancient ditties floating up the stairs, getting slower and slower as the gramophone runs down! Technology eh? Back to the stitching. I've prepped three more pages for my Hadrian's Wall book. One is a simple Bondaweb landscape that needs some quilting, another is the same landscape but created with oil pastels, ditto the stitching, and, finally, I've gathered fabrics and thread together for a texture/shades of the Fells piece. I'll work on the handstitching on Tuesday at Country Roads Quilters. I also made an "infinity scarf". This is a pattern I admired on quilting friend, Fenella, a few months ago and I have finally created my own. I wouldn't suggest using chiffon as I did, it was a bit of a nightmare to keep under control, but I like the drape of it and the contrast of both the styles and textures of the fabric I chose. Since taking the photograph I have top stitched the scarf as I thought the edges looked rather too soft when I saw the picture. 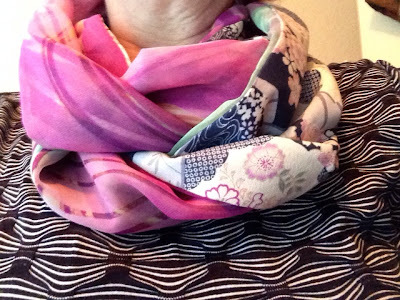 I was given the pink/indigo print by lovely Carin, in Japan and bought the pink chiffon from Images of Egypt at the Springfields Quilt Show. Of course it is a complete Japanese fashion faux pas to be wearing cherry blossoms in Autumn but they brightened my day so I hope I'm forgiven! Ha, ha! Wearing your cherry scarf in October is most appropriate - this year! The weather has been so extreme in Japan that nature too, is confused about the seasons. I saw on TV the other night that the cherry trees in one area have started blossoming in October. The poor trees have gone 'askew' in the hot temperatures; it was +34, breaking a 138-year-record. Lovely scarf - and I'm sure its just right for this damp breezy weather! Oooh, the scarf looks great. I've just been to Rome and saw lots of people dressed as Roman soldiers - and kept thinking Sam would love it!!! !